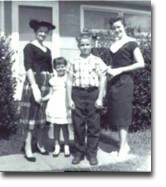 I grew up in a wonderful, middle-class family in Mississippi. 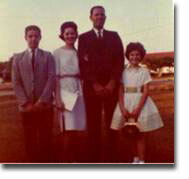 My parents were loving, hard working, Christian people who loved each other and who were incredible role models. We were all very different from one another, and our ages were all over the map, but we were a very close-knit family that shared most things and talked openly about our feelings. My sister was twelve years older, my brother five. My sister was a beauty queen, and my brother was a sports hero. How cool was that for a five year old? Not only that, but my “big” sister was a beauty queen! She won the local beauty pageant and went on to compete in the state pageant. I was in the second grade by then, and I was just in awe of her. I can remember vividly (with my cropped off hair and my Tomboy ways) running through the hotel lobby and rounding the corner just in time to run into Lynda Lee Mead, Miss America 1960. I am not kidding you. She had on the crown, the gown, the sash – the whole nine yards. I literally rounded the corner and ran smack into her hoop skirt. She was the most beautiful thing (besides my sister) that I had ever seen. WOW! My “Forest Gump“ days had begun. My sweet sister won the bathing suit competition and was a runner up. Two years prior, Mary Ann Mobley was crowned Miss America. The following year it was Lynda Lee Mead. To my way of thinking, my sister should have been Miss America that year! She sure was pretty enough to have been. Now, my brother was a different story! I was literally his shadow. He was “Mr. Athlete.” In fact, the high school coach at the time, Billy Brewer, who went on to be the head football coach at Ole Miss, said that my brother was the best athlete to ever come out of my home town… and he was! I adored him! Still do! At one point, the neighborhood boys, Kelsey, Jean, and David, formed a baseball team with my brother. I HAD to be a part of it. So, they came up with a way for me to join in and feel a part of the group without being in their way. They told me I could be the “getter” of the team, a very important position! Anytime the ball went out of bounds, my responsibility was to “get” it. I was almost in Jr. High School before I realized there was no such position on a real baseball team. I was a good “getter,” though. We were also very fortunate because my Grandma, my mom’s mom, lived with us during the winter months every year. One of my most vivid childhood memories was sitting on the bed behind her each morning and watching her brush her waist length, gray hair, and then twisting it up into a perfectly symmetrical bun secured with small hair pens and combs. The image of her long hair, her small arthritic hands, her incredibly graceful movements, her reflection in the mirror, and her soft humming while performing her daily ritual will always be with me. I was blessed. In high school, I do not know how, but I walked away with just about every honor and award one could, non-academic, that is. I was just a very sincere person at the time. I just loved everyone and was nice to everyone. I went to high school during the sixties (in Mississippi if you can imagine) and integration had just begun. Once, I can remember having “spend-the-night” company over when I was in grade school and the two of us sitting up in bed talking and crying because we were so scared. James Meredith had just been shot at Ole Miss. Before the night was over, we envisioned tanks and National Guardsmen marching down our Main Street as blacks tried to integrate our local University. We just couldn’t understand the problem or why someone would get shot over something like that. We were scared to death. The whole world was changing. Years later, my high school graduating class was one of the first to have black students. They were all good students, great athletes, and very attractive. Still, it had to be very hard for them. I remember making a priority of not treating them any differently. Maybe that was why my fellow students looked upon me so favorably. I do not know. 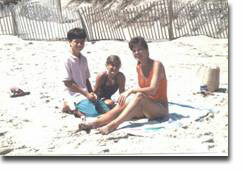 I certainly did not have my sister’s good looks or my brother’s athletic ability, and academic scholar, I was not – yet. What else could it have been? Anyway, it made me feel warm, and welcomed, and very loved. I was a cheerleader for six years and the head-cheerleader for two, B-Team and Varsity. I was “Miss Lee High,” Hall of Fame, Class favorite, Homecoming Queen, President of the Girl’s Athletic Association, female lead in the Senior Play, you name it. I was even selected as the Grand Duchess of the Out of Town Royalty at the Memphis Cotton Carnival when I was a senior in high school. What a shock. Honestly, it was kind of embarrassing. I didn’t ask for any of it. It just kind of happened. It all came very easily without thought, strategy, or planning on my part. It was all so amazing. I was glad, though, because I could see how proud it made my whole family. By this point, my sister had her own family, my brother was married and living in a city not too far away, and my dad, who had traveled for years with his job, had become disabled enough that he was working in town and was home all of the time. For as far back as I can remember, my mom worked, even when it was unheard of – when a woman working outside of the home was so extremely rare. Then, in her middle years, she worked, took care of us, kept the family going, but also had the added responsibility of taking care of my father who was very ill for the last fifteen years of his life. She worked all of her life. She belonged to numerous church groups, social, and garden clubs. She cooked like “Betty Crocker.” In younger days, she sewed every stitch of clothing we wore, and took care of my father’s many physical, monetary, and emotional needs during his long illness. She had more friends than anyone I have ever known, from all walks of life, and she was absolutely HILARIOUS. She kept all of us laughing even in the worst of times. Mom passed on in August of 2004. I still reach for the phone to call her sometimes. She was my best friend. My Daddy was 6’4”. He was the strongest, most handsome man I had ever seen. He was tall, muscular, slender, and was always, always tanned. His mother was part Chickasaw, and his father was “Black Irish,” so his coloring was magnificent. My brother and sister actually probably knew him better, because by the time I came along, he was the foreman of a construction crew and traveled out of town all week, only coming home on weekends. That meant mom handled all of the discipline, too. That also meant that mom was viewed as the “bad guy” and daddy would come home and everything would be wonderful. I loved the weekends! Mom did, too! When I was older, he started to slowly become ill. After that, he took a job at the company headquarters right down the highway and was home all week – every week. He was not that sick, yet. We had no way of knowing what lay ahead of us. We were all just thankful he was not traveling so much. At first, his foot would drag a bit when he walked. Then, I remember he tripped and fell at a construction site and broke his arm. It took months to heal. A scrape or cut would take forever to mend. Well, gradually, over years, it progressed from these small, seemingly innocent things to major deterioration that engulfed his whole body – including his speech. No one knew what it was. It was similar to Amyotrophic Lateral Sclerosis (Lou Gehrig’s disease), but it was far slower. Mom flew him to many major hospitals during that time – Mayo Clinic, Oshner’s, you name it. He was even written up in medical journals. I can remember thinking nothing of daddy being in The University Hospital in Jackson, Mississippi and seeing two doctors and ten or fifteen medical students enter the room to examine him and discuss his condition right in front of him. Amazing what you can get used to. Long, painful story short – he died in 1985. Actually, his cause of death was listed as Soriasis of the Liver caused by years of battling Hepatitis he had contracted through a blood transfusion almost a decade earlier. A very long and painful ending to a beautiful life. I miss him daily. He was a good man. Throughout all of the pain and suffering, I do not once ever recall hearing him complain about his luck, dwell on his ailments, or utter an unkind word about anyone. So, that is a large part of my personal, childhood history. Growing up, we were all held together securely by strong ties made up of love, faith, character, values, and ethics. There was yelling – we were a very demonstrative family – at least we three kids were – but there was never any hitting or drinking in my home, spankings when we deserved them, but no hitting, ever. Our problems (and every family has them) revolved around illness, a problem one feels helpless to fight, a problem the members of the family unit have no control over. There were other problems that affected the rest of us, but no one could explain why… at all! 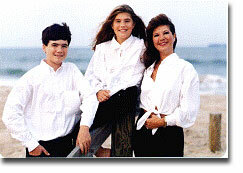 My mom and my dad had perfect hearing, but all three of the kids have developed major handicaps! (I am putting that mildly.) My brother and I are basically deaf… We have lost significant hearing in both ears – specifically, I have lost 80% hearing in each ear. My sister has also started to lose her hearing in the last few years. It hit my brother at the age of thirty. Think how hard that is for a man! I lost my hearing literally “over night” at forty – very hard to accept, and my sister’s hearing declined significantly at fifty. Specialists from Baltimore to Memphis say the exact same thing – even without conferring – that it is genetic – like speckled puppies. No one knows when they will pop out! Obviously, there is nothing that can be done for it. Surgery would be of no use at all. Dealing with it is the only thing we can do. Another thing, losing your hearing totally undermines your personality. Once an extrovert, I became an introvert! I needed someone to “interpret” for me. It is honestly a strange affliction in that you can hear OK with hearing aids, but with the nerve damage, your brain cannot process it as fast as others – or some times at all. “Ball” may end up sounding like “tall” – none of it may make any sense tonight, but in the morning it might. You need someone to help you interpret many times. For example – if I went to a movie and had on a head-set, I usually did OK. But if it was an animated or narrated film – Oh Boy! I was lost! No captions? No lip reading? No clue! Yes. It is a pain. Another pain (and very strange) is that if there is music playing in the background, I often won’t even “hear” it. But if someone says, “Hey! Great music!” I realize there is music playing. Even stranger – if I hear it, I might not recognize it. All it takes, though, is for someone to say one or two words from the lyrics, and I’m “good to go.” I recognize it every time. Mind-boggling! It has affected more than my personality. My career suffered immeasurably. Once very active in the community and in charge of major capital campaigns, everything had to be adjusted. After a while, it just became too stressful to try to “keep up.” Thank the Good Lord I have an employer who understands that the deterioration of my hearing is not reflective of a deterioration of my intellect! Someday, I may write a book about the whole experience. I will call it The Incredible Shrinking Woman or maybe The Vanishing Woman. It is amazing how people’s attitudes change towards you once they find out you are hard of hearing. It could be worse, though. It could hurt or be life threatening. It is neither, thank the good Lord! But it is a pain for everyone who loves us or works with us. Oh well, if you are going to be in our lives, you are going to have to DEAL with it, too. After graduating from college in 1973, I married my hometown, college sweetheart who was a Naval Academy graduate and an A7 Pilot in the Navy. We moved to California. Imagine a small town girl from Mississippi moving to the “Golden State.” I was beside myself with excitement. I will never forget when we got to Lemoore, California after driving for days. We drove through the little town, and I was shocked that there were no stop lights. It was so small, it only had stop signs! Then, main street ended in a “T” with highway 41 which lead to Fresno. When we stopped at the 3-way stop sign at the “T,” directly in front of the car - for as far as the human eye could see – were cotton fields! Cotton fields! I cried! Literally! Little did I know that at the age of 21 I was about to enter one of the sweetest eras of my life. I taught drama and English Literature at the local high school. I sponsored the ski club. I directed plays. I danced in a dance company in the next little (but bigger) town, Hanford. I modeled. I traveled the Orient when my husband was on cruise there. It was a glorious time! I like to refer to it as “B.C.” (Before Children). We were free to go and do as much as we wanted to, and we did. We were in a great location and could be in any terrain – from the Pacific Ocean, to the dessert, to the mountain tops within an hour in any direction. We had great friends, great jobs, great love, and great fun. We moved back and forth from Mississippi to Virginia Beach a number of times as my husband tried to move from naval aviation to being a commercial pilot. He eventually succeeded and was hired by Pan American Airlines. 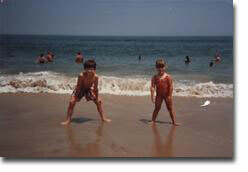 During that period, we had two beautiful children, Jeremy and Jessica, and eventually ended up on the East Coast. I had always taught public high school in Mississippi and California and had very limited experience with babies and toddlers, so I went back to school and got my Lifetime Diploma in Montessori Education. I found a benefactor and, with her money, I started one of the first Montessori Schools in the state of Mississippi. I was the happiest I can ever remember. I worked at the school all morning taking Jeremy, three at the time, and Jessica, a newborn, with me. The afternoons, Jessica and I spent at home together, and the family reunited in the evenings. It was wonderful! I can remember when I was in the hospital right after having Jessica, still on the phone calling everyone I knew from church and from the neighborhood asking them if they would be interested in enrolling their children in a Montessori School. It was not uncommon to have someone say, “A Monastery school? Why would I want to put my child in a Monastery school?” Needless to say, there was a great deal of educating, marketing, newspaper articles, and TV talk shows to do. The Children’s House of Meridian opened with 26 students when Jessica was three weeks old. The school is still one of my proudest accomplishments. 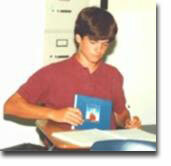 Once we settled in Virginia Beach, I went back to teaching high school at an independent school in the area. Before long, I was promoted to Assistant Director of the Middle and Upper Schools, then to Admissions Director for the Middle and Upper Schools, and finally, in 1989, to Director of Development. It was a joy working with people I loved, and students I loved, all for a worthwhile cause. It was also a joy to have been able to have my children with me, and to know their teachers and friends intimately. Jeremy graduated in 1997 and Jessica in 2000. I finished my master’s degree in 1999 while still working full-time. I now coordinate the school's Communications and Public Relations and have been at the school for over twenty years. The children's father and I were married for 16 years - until 1989. We still remain good friends and have always taken our responsibilities for the children very seriously. He is a great father. Being a Navy and airline wife, I moved my family 13 times in 16 years of marriage, and there were long periods of being alone. We never seemed to fight, at least nothing out of the ordinary for a married couple with two young children and financial pressures. We had simply grown apart and gone our separate ways over the years. During the first few years after we divorced, I dated a good bit, but no one really turned my head. Then in 1992, I met JP. We dated on and off for seven years and ended up getting married in 1999. We were divorced in 2005. Today I am living happily in my beautiful, little home in Virginia and am enjoying life immensely. It is the first home I have ever owned on my own! Besides loving work, I try to stay as involved in the community as my hearing loss will allow. For eight years I was a member of the Central Business District Association, which was responsible for the development of our beautiful Town Center. I was a member and co-founder of the Richard Hassell Foundation, a charter member of the Mississippi Montessori Association, and sat on numerous committees on the Hampton Roads Chamber of Commerce. On the state and national level, I served on the Board of the National Association of Independent School (NAIS) Public Affairs Leadership Network, was on the National Committee on Planned Giving, was a member of the Virginia Planned Giving Study Group, the Virginia Independent School Development Association, and the Hampton Roads Development Directors' Group. Currently, I am a member of the a local Rotary Club (my surrogate family) and am on the Hampton Roads Salvation Army Board. This must all sound very self-indulgent, but it is not meant to be. It is hard to sit down and write out your own bio.